Giggles is an Ideal doll. My sister acquired this doll from a local doll show for half off of a half off sale. We do not believe that her clothes are original and she was missing her shoes. (WE DON'T HAVE A PICTURE OF HER OUTFIT) Her hair appears to have been cut and she has an ink stain on her forehead. The hard plastic around the shoulder joint is broken. 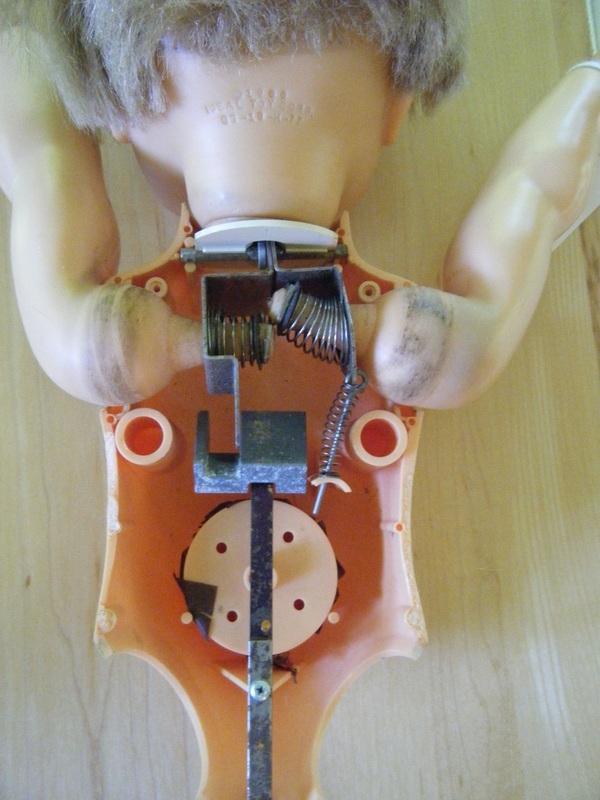 Access to the interior of the doll is through 3 screws. 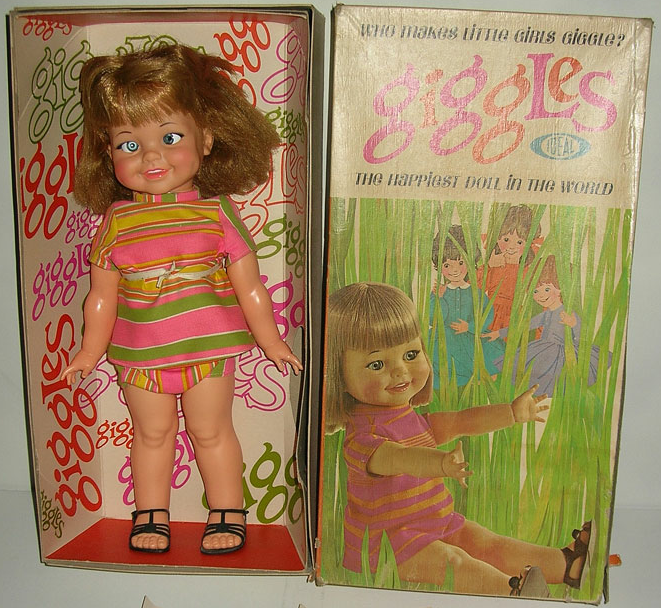 Giggles is 18 inches tall and was produced from 1967-1969. Her body and legs are plastic while her arms and head are vinyl. Giggles does not require batteries or winding to operate. When you pull her arms back and forth in an exaggerated clapping motion her head moves, causing her eyes to roll back and forth. Simultaneously she makes a giggling sound. The giggling sound results from a vibrating weight drawing air through a reed inside a chamber covered with a rubber diaphragm. So it sounds like the mask accessories were exclusive to Sears! I also found Baby Giggles in the 1968 Sears Christmas Wishbook - she was sold for $8.97 and she giggles by moving her left arm up and down so they must have decided that was a better way to do it. The head movement and giggle feature are all described exactly the same as for Giggles. 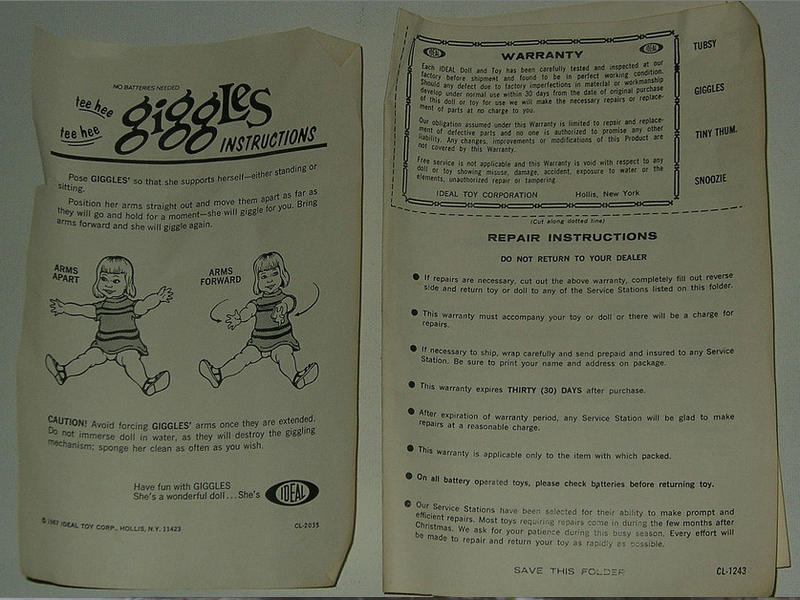 Below are pictures (taken from a posting on eBay) of what an original Giggles with box and instructions would have looked like. Patent US3494323 describes the mechanism for making the doll giggle. Figure 1 - Front view. Notice the grill in the stomach where the giggling sound comes from. 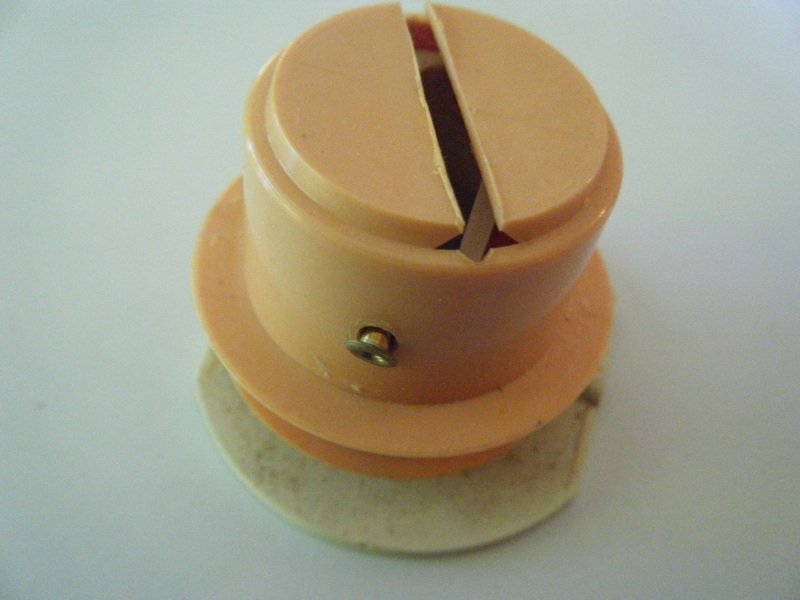 Figure 2 - The back view shows the location of the 3 screws that need to be removed to open the doll. Figure 3 - Her hair has been cut and there is an ink stain on her forehead. The eyes are not connected to any mechanism. They roll around based on the angle of head tilt. This tends to give her a cross-eyed appearance. 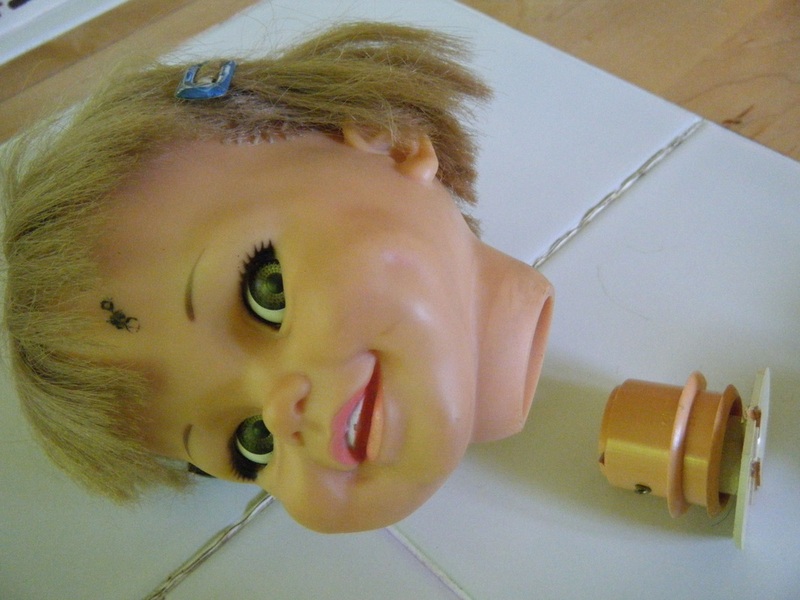 Figure 4 - The Ideal doll mark and the year (1966) is visible on the back of the head. The inner working of the doll are apparent. The arms show some wear and discoloration at the shoulder joint. Moving the arms causes the head to rock/tilt which causes the eyes to roll. Movement of the arms also causes the spring with metal mass to oscillate. This is turn causes the piston to move in and out, drawing air through a reed, making the doll giggle. 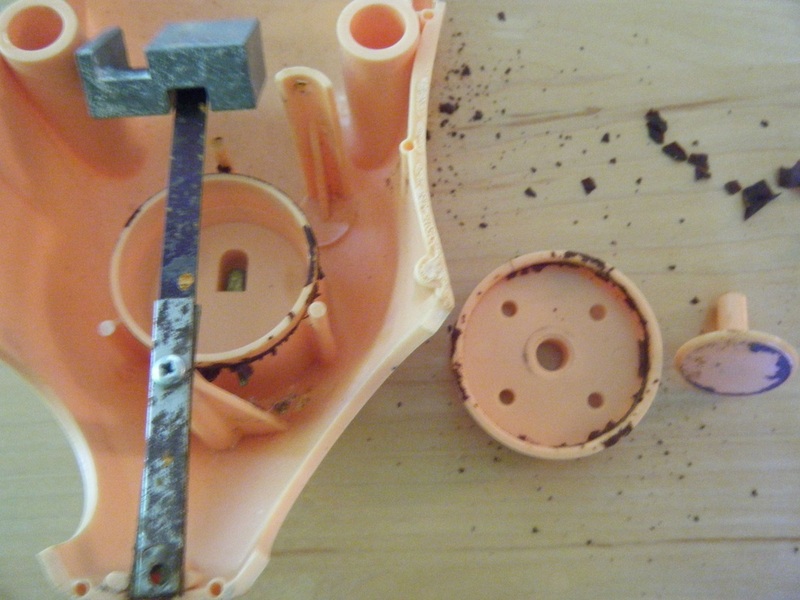 Figure 5 - the rubber diaphragm (brown crumbs) was completely disintegrated. The reed is visible in the arch shaped opening in the cylinder below the spring and mass. 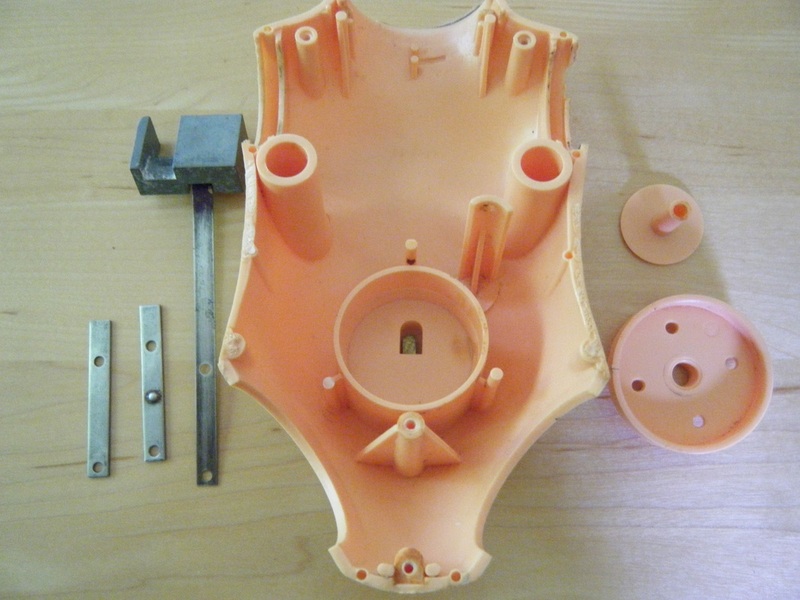 Figure 6 - The interior of the doll after being cleaned. The rust was cleaned off of the spring and supporting pieces. 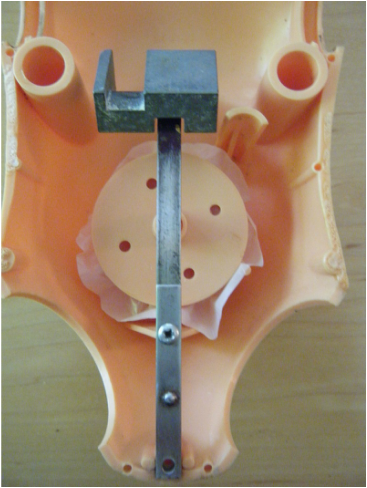 Figure 7 - We followed the recommendation of a website and replaced the diaphragm with a piece of material cut from a plastic bag. 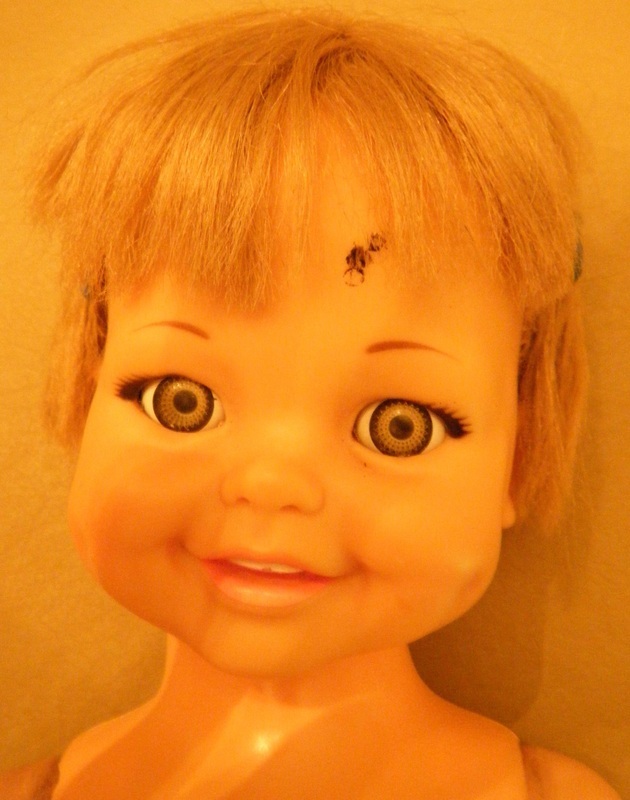 The doll giggles but not very well. We feel that a better material would be a piece of balloon or vinyl glove. The body seams are visible. The body had either been opened before or the glue failed. A number of plastic locating pins were broken off. Figure 8 - the neck had to be extracted from the vinyl head in order to be repaired. One of the two rivets holding the inner neck piece to the outer neck piece had popped out and ended up inside the head. Figure 9 - A close-up of the neck mechanism. The inner white piece has a slot that is rotated relative to the slot on the outer skin color piece. The two are held together by two rivets that act as pivot points. The combination of offset slots and the pivots cause the head to rock/roll when the doll's arms are moved. The rivets were too loose and dabs of super glue were used to keep them from popping out again. Figure 10 - the neck mechanism is attached to the arms. The rod fits into a cradle in the white neck piece. The long metal arm passes through the two neck pieces as transmits the rocking/roll movement to the head.